Well, we have made it through our first month with me as your President. So far, so good. We had a very busy July. 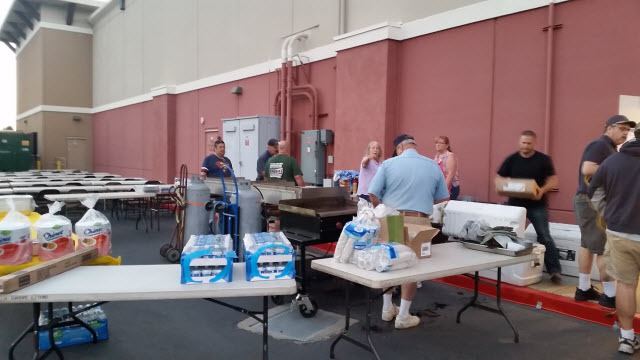 Our first meeting of the month was the Past President’s BBQ thanks to Immediate Past President Bob Brewer. Our board meeting was handled by 2nd VP Sharon at The Barn Cafe in Sheldon. Our final dinner meeting of the month was also held at The Barn Cafe in Sheldon. Thanks to all of you for the great turnout. 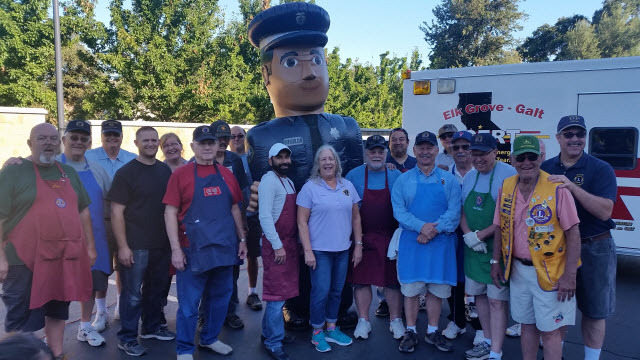 As is often the case, we again doubled up our community events and served pancakes at the Senior Center Breakfast on the 9th, followed by cooking hamburgers and hotdogs for the CSD Community Campout at Elk Grove Park. 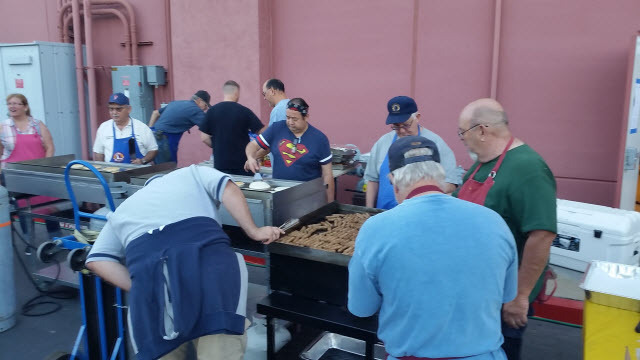 The following morning, the crew returned to the park to prepare sausages and pancakes for the approximately 340 campers. It was a great event. 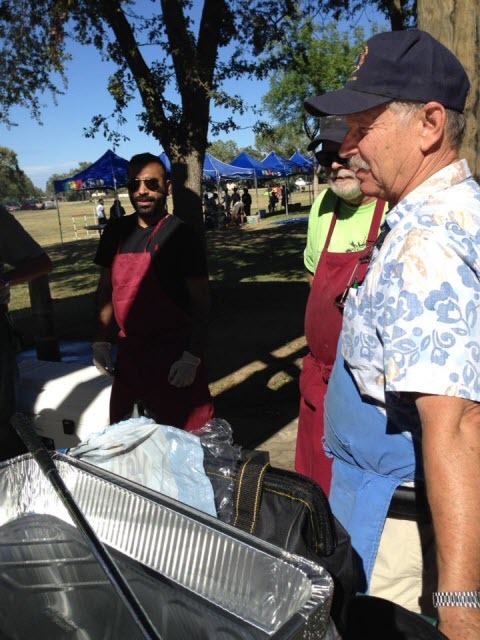 Thanks to Lions Bob Brewer, Dave King, Dan Pearson, Bill Hibbard, Vanita Kumari, Harjeet Kumar, Pancho Sanchez, Jim Switzgable and Lorene Fuhs. Later in the month, we assisted the Strauss Festival by handling the collections for parking. Thanks to the chair of the event, Lion Dave King, we had great crews on Thursday, Friday, Saturday and Sunday evening. 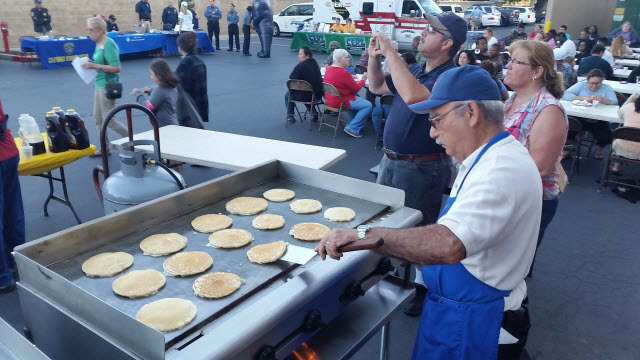 If that wasn’t enough to keep us buys over the weekend, Lion Jim Switzgable’s crew was up early on Saturday morning to cook pancakes at the Kohl’s Child Spree in support of our friends at the Optimist Club of Elk Grove. 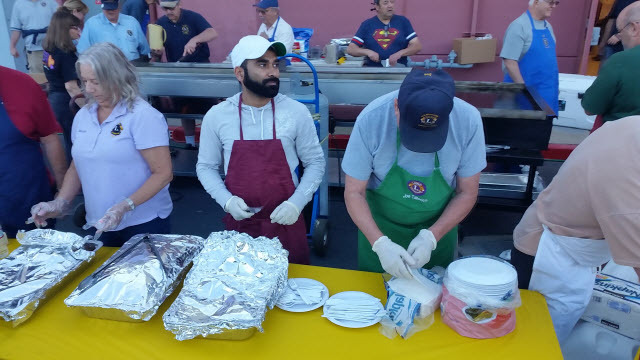 Thanks to all of the Lions who volunteered. We could not be the force within our community without you. We also have the following plans for August. We will start off on the 3rd with our Chili’s fundraiser. We passed out hundreds of flyers during the Strauss Festival and hope for a great turnout. 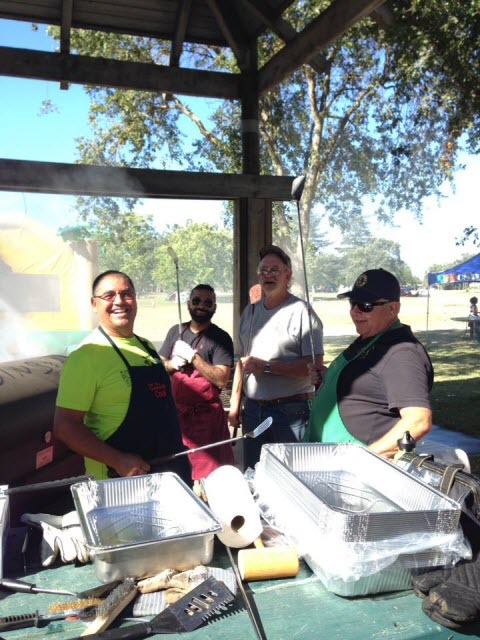 On the 6th Lion Bob Brewer and crew will handle the Historical Society BBQ. We have our regular meetings and the board meeting. Our first meeting, on the 8th will be at the Senior Center. We will be doing the Senior Center Breakfast on Saturday the 13th. The board meeting on the 15th and the 4th Monday meeting on the 22nd will be at The Barn Cafe in Sheldon. I hope to see all of you at our upcoming activities. Location: The Barn Restaurant, Sheldon. I attended the Tribute to Iris Zimbleman, the creator of the Elk Grove Strauss Festival . 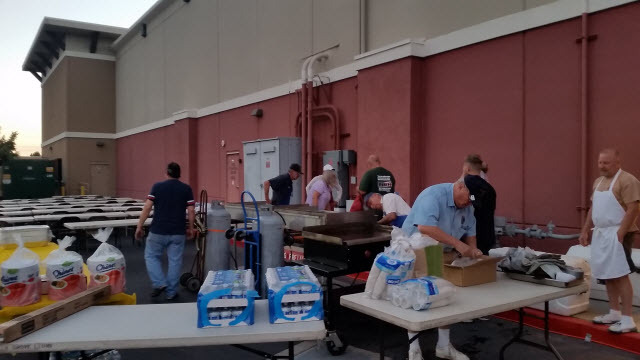 We happily worked this event in July. 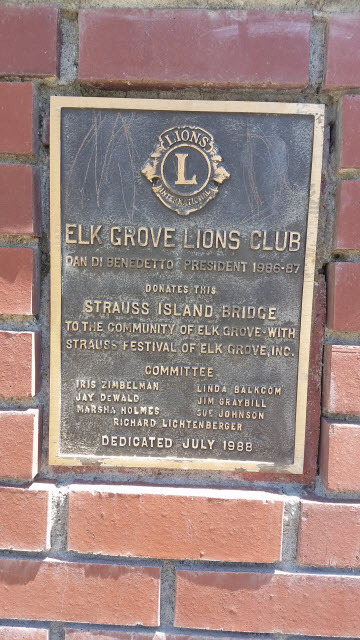 For the club members who don’t know a lot of our history, here is a photo of the plaque on the Strauss Island Bridge thanking the Elk Grove Lions Club for building it for the community. DUES!!! DUES!!! Dues were due by the end of June. Many of you still have not paid yet. Please make sure to bring your checks to the next meeting or go online to our website and pay your dues there. All you need is a credit card, and you are set to go. 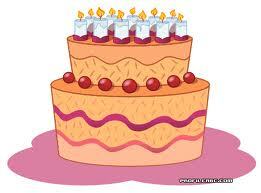 has decided and aprroved we would only cook and serve for event. 2. Do we want to do a Carnitas Feed? Very few days available in September? Lion Lorene Checked With Lion Pancho and he is avaiable to cook in October. 3. Would we rather do a TriTip Drive Thru? May be easier to do. Is Lion Weaver available to cook? 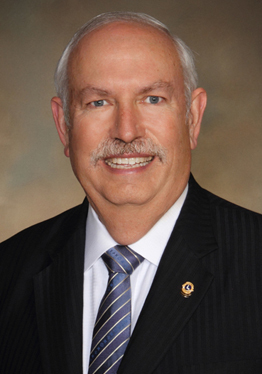 Lion Dan has presented the club with options on having a Lions club Cookbook for Lions to sell at our events. Board will re-address this in the fall due to the lack of our funds. 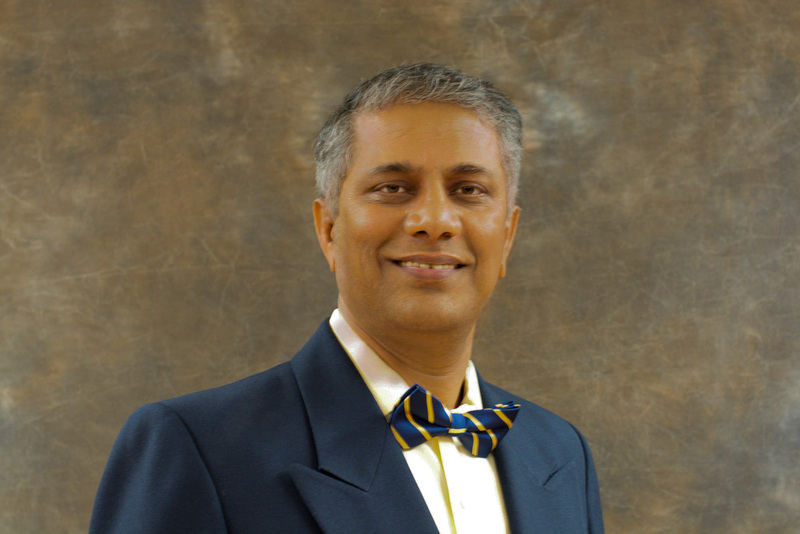 This entry was posted in Newsletter 2016-2017 on August 1, 2016 by admin.